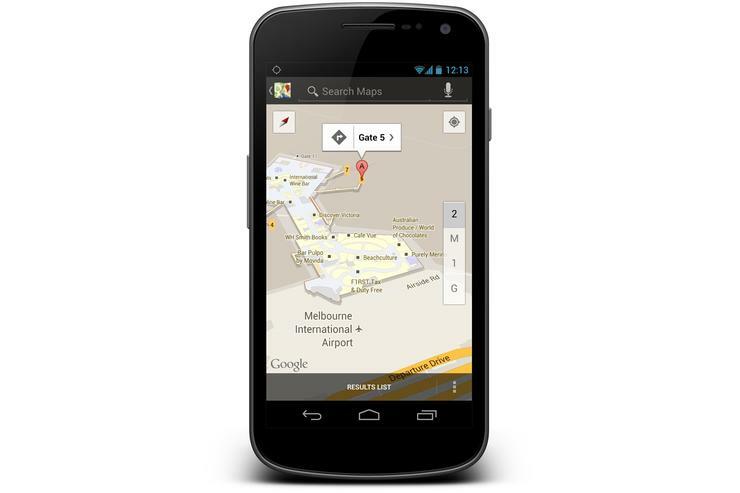 Google has announced that its Maps application on Android devices can now display indoor maps of selected Australian airports, shopping centres, train stations, sports venues and other locations. The new feature is available now for over 200 locations across Australia and includes a selection of iconic Australian venues like the Sydney Opera House, Flinders Street Station in Melbourne and the Museum of Contemporary Art (MCA) in Sydney. The indoor maps utilise nearby mobile network towers and Wi-Fi networks rather than a smartphone's built-in GPS to determine a location as traditional GPS based location often doesn't work inside buildings. Google says the indoor maps will automatically appear when you zoom in on a building using the Maps application on Android devices, and then fade away when the map is zoomed out. "Indoor Google Maps are like having an indoor directory in the palm of your hand - helping you determine where you are, what floor you're on, and how to get to where you want to be," reads a post from Google Australia's official blog, posted by the company's Partnerships Manager, Jamie Woodbridge. "In some locations, you’ll even be able to use the familiar "blue dot" icon that indicates your approximate location — even when you’re inside. This means that when you move up or down a level in a building with multiple floors, the map will automatically update to display which floor you’re on." Google says the blue dot feature indicating your exact location is only available on a selection of the 200 indoor Australian venues initially utilising the feature. The company says it will continue to add new indoor maps to public buildings across Australia over the rest of this year. The indoor maps feature is available now on all Android devices, but Google hasn't specified if or when the technology will be available on its iPhone application. In addition to Australia, Google has launched indoor maps in the US, UK, France, Japan, Canada, Sweden, Denmark and Switzerland. A full list of the 200 Australian locations that support Google's indoor maps is available below.